The Journal of Applied Sport Management (JASM), the official publication of the Applied Sport Management Association (ASMA), is a quarterly peer-reviewed journal providing the latest research in sport management. The goal of JASM is to be a valuable addition to the practical, specialist literature by focusing on empirical results and conceptual work that can inform sport industry practice. Accordingly, only manuscripts that make a strong contribution to the sport industry based on practical, conceptual/empirical grounding will be considered for publication. 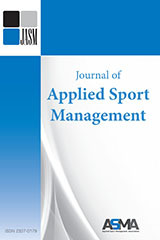 Subscribe to the Journal of Applied Sport Management. The Journal of Applied Sport Management (JASM), the official publication of the Applied Sport Management Association, invites high quality manuscript submissions and pledges a prompt and fair review process for all contributing authors.